Justice Talks: Law and Justice do they meet? 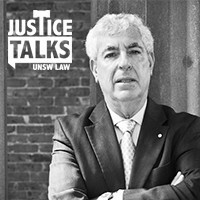 Join us for the first of the UNSW Law Justice Talks public lectures in 2013. Former Federal Court of Australia judge, the Hon Ronald Sackville, will explore his own ideas of justice as they have been influenced by the various roles he has held throughout his career - as legal academic, Royal Commissioner, law reformer, practising barrister and Judge of courts in Australia and elsewhere. Register now to hear these compelling insights from a confused career in the law.